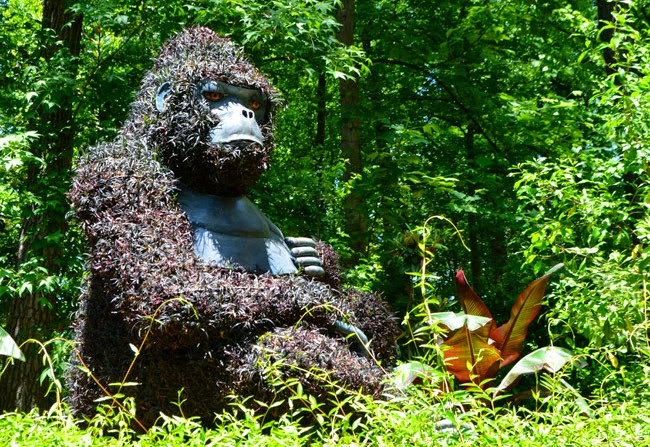 Orangutans, several species of exotic frogs, and a pink unicorn are among the stars this summer at the Atlanta Botanical Garden's new "Imaginary Worlds: A New Kingdom of Plant Giants" exhibition. 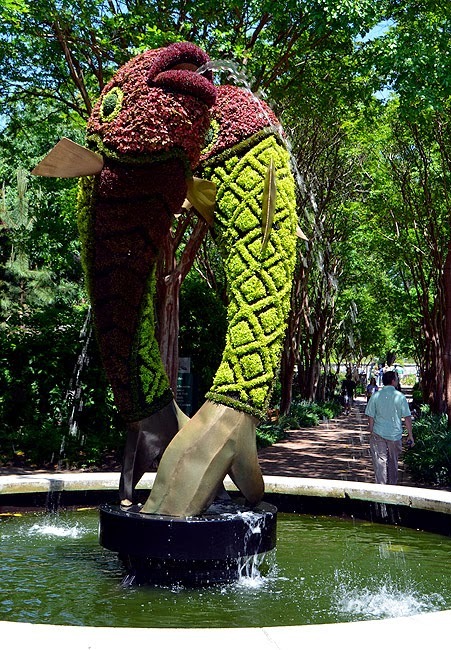 Now through October 31, Garden visitors will enjoy nine new characters for a total of 28 larger-than-life living sculptures. “This exhibition will be the largest ever presented in the U.S. and promises to be another ‘wildly’ successful one,” says Mary Pat Matheson, the Garden’s president and CEO. 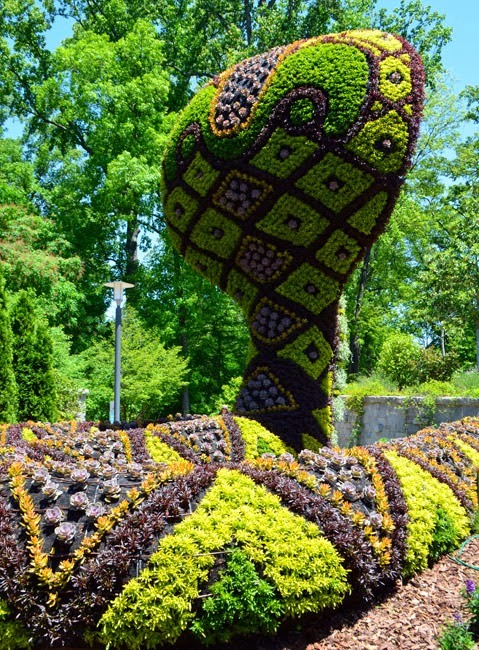 For one more summer, International Mosaiculture of Montreal brings to Atlanta a truly unique garden experience. 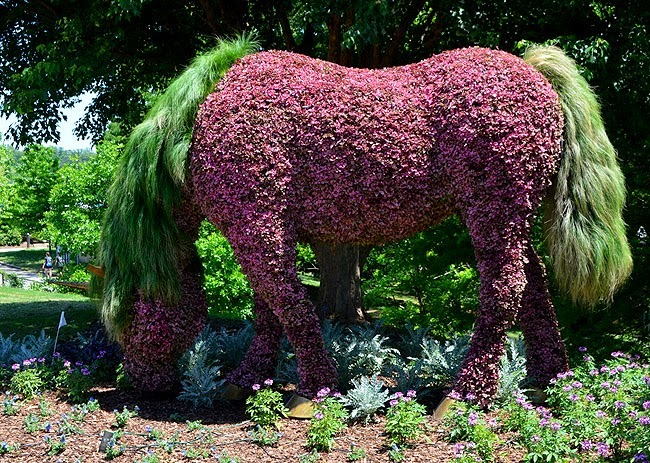 The 28 living sculptures, most comprised of thousands of individual plants, bring to life many animals, real and imaginary, as well as Earth Goddess, who is a permanent feature. 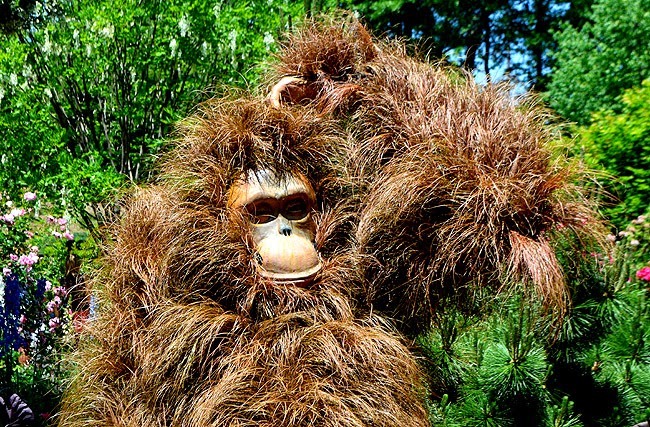 I've long been wonderfully entertained by orangutans, so when I learned that they would be featured in Imaginary Worlds, I was totally excited. And the pair look fantastic! 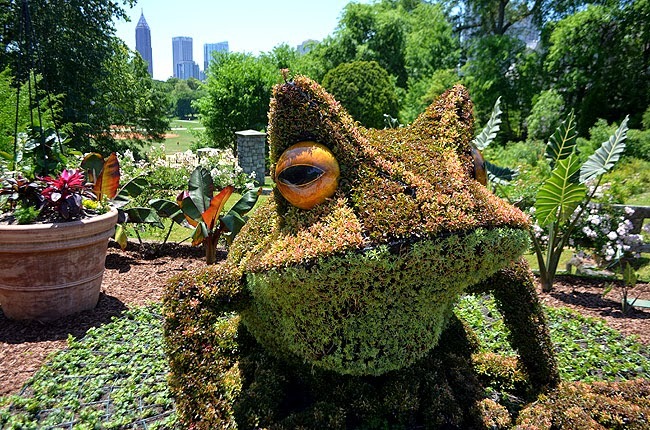 Many visitors don't realize until they visit the Atlanta Botanical Garden for the first time that the Garden is engaged in amphibian research and conservation, which is quite a significant program. And at any given time, there are hundreds of frogs in the Garden. Guests get to see some of the endangered species in the Fuqua Conservatory, and there are even more rare species on the Garden complex, but off public view. And of course there are the hundreds of bullfrogs that visitors see in the various water features. These conservation efforts are quite serious...they're addressing the extinction of dozens of species of frogs in Latin America--it's rather cool that Atlanta is involved in this effort, and perhaps critical to human survival in the long run. For an even more unique experience, catch the Imaginary Worlds sculptures during the evening hours at Cocktails in the Garden. Each month has a different theme and specialty cocktail, this month's being "Earth Goddess: I'll Have What She's Having." Cocktails in the Garden is Thursdays 6:00 p.m. - 10:00 p.m...a great 'date night' option. It's included in admission, but cocktails are separate, but are reasonable. Lethal Rhythms will be DJing, there will be chef demos in the Outdoor Kitchen, and be sure to check out Science Cafe every third Thursday of the month. The unicorn in last year's Imaginary World's exhibition suffered at the excessive rain Atlanta experienced. So, this year they're using different plants and she's in a new location. I think the kids are going to love the pink unicorn! Speaking of the kiddies, there's a ton of programming specifically designed to teach kids about gardens, science, and animals. And in the Children's Garden there's a well-attended Wednesday mornings story-time reading. I'm an animal lover, but not so much a pet person...could you imagine how neglected 'my' pet(s) would be as much as I'm out wanderlusting? I think it's responsible of me to not have a pet, as much fun as having one would be. 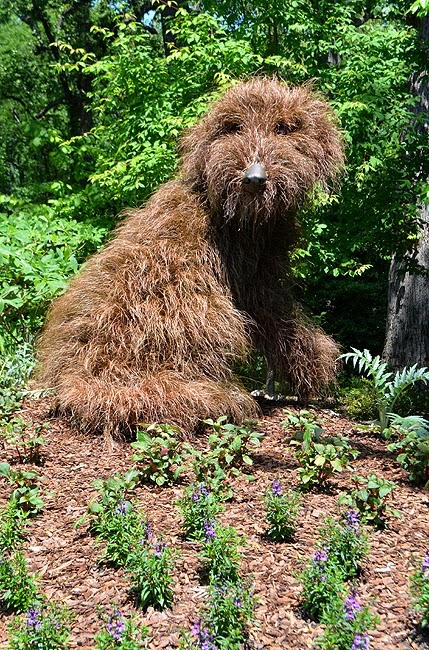 With that said, I've heard time and again from visitors that one of their favorite sculptures is the Shaggy Dog. And I've heard many say that he's made from pine needles, while in fact he's in fact made of living plants, that just happen to look like pine needles. He's adorable either way. I don't know if it's just because the Imaginary World's plants are new and fresh, or because of the new patterns, but they're incredibly vibrant! I hope we don't have as much rain as we did last year...if not, we're in for a full summer of spectacular giant living sculptures! I love hearing the fascination of visitors who comment on the "dancing" fish. In fact, they spin to ensure that all sides receive ample sunshine. What a wonderfully brilliant solution, right? 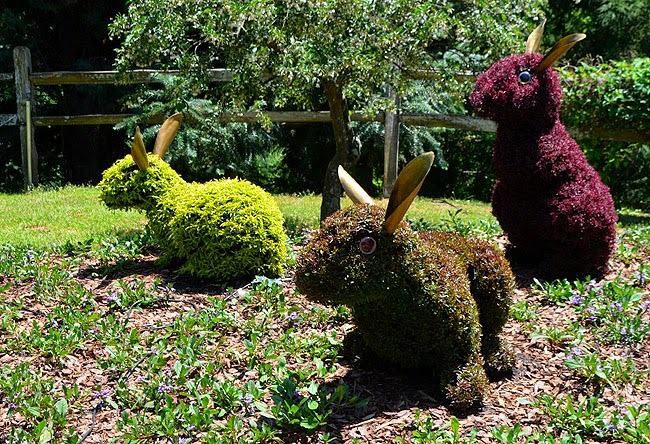 With the increase of nine sculptures this year, they're spread further throughout the Garden...a wonderful solution to getting visitors to explore parts of the Garden that many visitors might not see during a typical visit. Some of the sculptures are in and near the Aquatic Plant Pond and near the desert plants garden on the opposite side of the Conservatory from the Edible Garden, which I think is brilliant...there are some beautiful plantings on that side of the Garden! With 28 living sculptures there are ample photo-ops, particularly the Ogre and the two Cobras, the Cobras being one of the most popular photo-ops, and for good reason...they're spectacular! Just be sure to check out the back of their hoods, meaning you'll need to exit the main path to see the incredible and brilliant patterns on the cobras' backs. 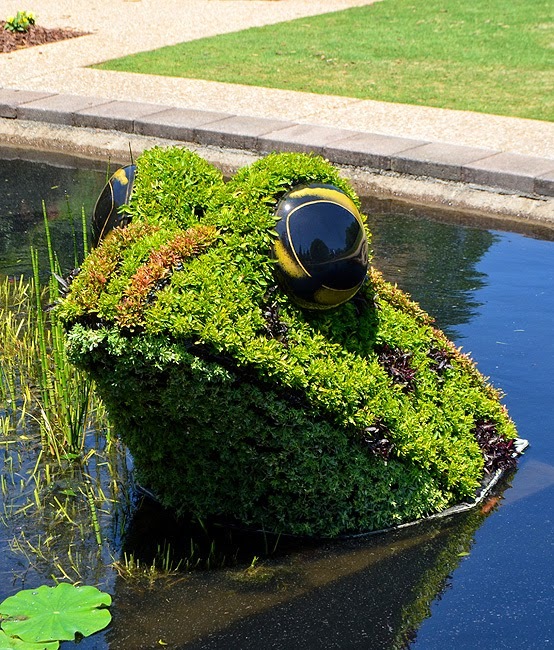 I'm loving this particular frog in the fountain in front of the Fuqua Conservatory ... seriously, look at him! How can you not smile looking at those fantastic eyes?! Visitors are invited to view a public frog feeding every Saturday morning at 11:00 a.m. The amphibian specialists conducting the feeding love answering questions about the frogs and the Garden's conservation efforts, so ask away! 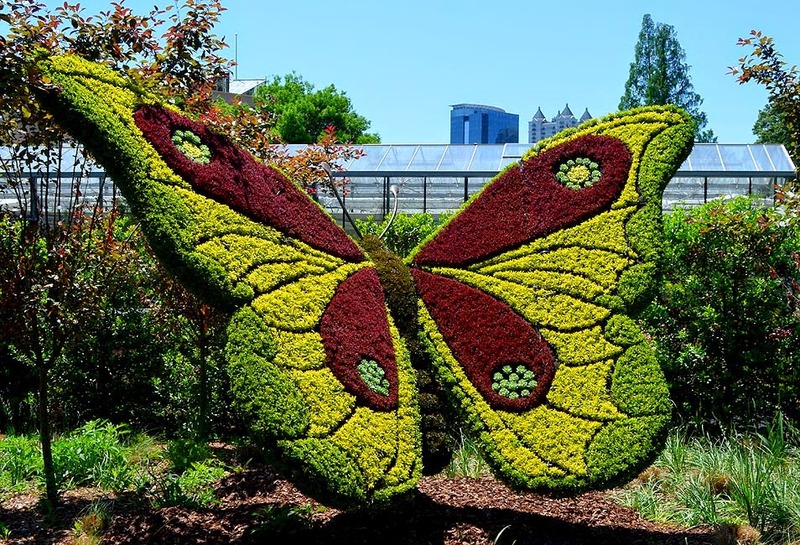 Make plans now to see the new "Imaginary Worlds: A New Kingdom of Plant Giants" at the Atlanta Botanical Garden, and I recommend seeing it soon, because I'm certain you'll want to see it more than once. And check out the extensive programming at the Garden...there's a LOT going on there! We went yesterday, inspired (as always) by your photos! Great exhibit this year. Thanx!! Thank you, Lesli! Very kind of you to say. I do think the Garden outdid themselves..."Imaginary Worlds" AND "The Four Seasons" are awesome!